One of the earliest posts I did here at NCN was of a photograph of three Iraqi children staging a mock execution with toy guns. The image, which literally stopped me in my tracks, bordered on the surreal, the expression on the boys faces marking a dialectical tension between the “pleasure” and “horror” of human violence. I’ve thought of that photograph often over the past year, especially as I have encountered more than a few photographs of children with toy guns, not least this AP photograph which showed up this week on the Guardian website. The caption reads “Baghdad, Iraq: A child armed with plastic toy weapons approaches a US soldier on patrol in Sadr City.” As with the photograph of the mock execution, it is fraught with tensions that make it hard to distinguish between the real and the surreal. At first blush, the scene invites comparison to a shootout between two gunslingers squaring off in a frontier town. But of course the opposition between a fully equipped US soldier carrying a high powered, automatic weapon and a young boy – he can’t be more than eight years old – with toy guns suggests that something more than a simple parody is taking place here, though what is not exactly clear: on the one hand, we might view the scene with the same kind of reflexive and approving smile we use when we see children trying to act like their parents, cutely imitating what they take to be adult roles; on the other hand, we have a young Iraqi child “approaching” a US soldier in one of the most dangerous suburbs in one of the most dangerous countries in the world right now while appearing to point “toy weapons” at him. And, of course, any hint of an approving smile has to fade to deep concern. Are they really toy guns? Is this an innocent child or an insurgent? And even if the child poses no immediate threat to the soldier, is this an insurgent in the making, someone he will have to worry about down the road? But there is, I think, an additional and more important point to be made. As I noted above, virtually all of the contemporary photographs of kids with guns that have circulated in recent years are of either Iraqi or Palestinian children, literally the future citizens of countries widely assumed to support state terrorism and thus a direct threat to the United States and its European allies. During World War II U.S. propaganda typically represented Allied children as they went to school or church, played baseball, did chores around the house, and in general represented an uncorrupted innocence, while Axis children were represented as being trained in the arts of war (see, for example, Frank Capra’s Prelude to War). I do not want to suggest that photojournalists are complicit in some sort of concerted propaganda effort, but there can be little question that something like a visual trope is at work here as the visual representation of children—abroad and at home—become powerful signs of what purports to be a potent and pernicious cultural threat. 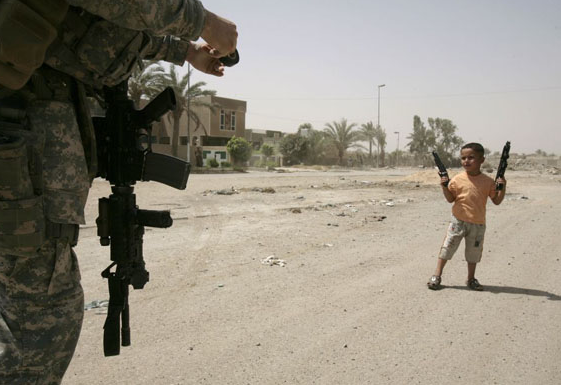 Return now to the photograph above and attend closely to its caption: “A child armed with plastic toy weapons approaches a US soldier on patrol in Sadr City (emphasis added).” The word “approaches” seems to domesticate the image some, as an “approach” is not necessarily a threatening move. And indeed, the image itself reinforces this ambiguity as it is shot from behind the soldier and at waist height, thus making it impossible to see his face and eyes, and so difficult to interpret how he is reacting to the child’s behavior: Is he smiling in recognition of his own childhood “playing soldier” in the backyard? Or is there the look of caution and concern? And yet, for us the viewers, operating within the contemporary visual economy of representations of Middle Eastern children, it may well be that “armed” is the more important verb in the caption, for while the child carries “plastic toy weapons” there is nothing to suggest that he is “playing” at anything. And while the “approach” might appear somewhat innocent, there are too many markers within the larger visual culture to suggest that “plastic toy weapons” are simply a precursor to the real thing. I think the western media looks for the story they want to present, and they find the pictures to back up their opinions. A picture of kids in Palestine or Iraq “playing house” or football isn’t newsworthy, but if they see them playing with guns, a picture gets snapped and then it gets passed all over the internet as proof that we don’t love our kids and we are raising them to be violent. Do you think if someone tried, they wouldn’t find plenty of pictures to take of American kids playing with store bought or improvised toy guns, toy tanks and fighter jets, GI Joes, Star Wars light sabers, toy Kung Fu weapons, and hundreds of violent video games? American kids watch the hundreds of violent films cranked out by the US film industry, and they act out the scenarios they watch. Sometimes the toy weapons are unrealistic ray guns or toy swords and such, but do you think that these toys teach less violence because they are less realistic? The toys you see in the pictures are only reflecting the reality those kids are facing. I grew up in the US, and I have raised my kids in the US and in the occupied Palestinian territories, and I don’t think that kids here in the West Bank play act violent games any more or less than they do in America. But children here know that the violence is real, because they are faced with the reality of soldiers on their way to school and oppression every day. Maybe the problem with “no caption needed” photos, is that we use our own preconceived notions to draw our conclusions about the meaning of the photos. We need the captions. News should give us more facts about things we don’t understand, not just dramatic pictures that reinforce our stereotypes. Alajnabiya: I think maybe you missed the point — or maybe I wasn’t all that clear. In any case, I agree with all that you say in the first paragraph. Indeed, I thought I said as much, albeit w/o the experience of having lived in the Middle East. BUT there is also another point to be made, which is that there is a tension created by the photograph and the way in which it is likely to be received in the U.S. The fact is that we typically do not see these pictures–whether they are available or not is not the question, though they are hard to find — of Western Kids and so the tension between presence and absence animates more of a sense of concern for what is going on over there. Thanks for writing. I hope you come back. I hope my comment didn’t give you the impression that I was critical of you or your analysis. In fact, I found it unusually fair minded and insightful, which is why I am a regular reader. But these images do upset me, because they do create an impression of “a culture that actively nurtures violence.” And then they get passed all over the internet as proof of Arab or Muslim culture being violent. My point was that the western media chooses to portray Arab/Muslim culture as violent, but it ignores that aspect of western, particularly American culture. When my boys were little, I refused to buy them toy guns, but it was hard to keep them away from all the movies and video games that glorify violence. My first thought when I saw the picture was to worry about the safety of the child, because there have been several cases of kids getting killed because soldiers mistook toy weapons for real ones. What do you think is in the soldier’s hands in this picture though? It looks to me like he might have camera too. Is the child posing for the soldier’s camera? alajnabiya: I did not think you were being critical, and indeed we are pretty much on the same page. The one thing that complicates this for me a bit is that just as children have been killed by soldiers who thought fake guns were real, stories circulate of soldiers being killed or injured by children wielding real guns (the implication being that the soldiers thought they were just kids playing, didn’t take them seriously, etc.). I have no way of knowing if such stories are true or not, but of course they resonate with the whole “global terrorism”/middle eastern religious fanatic narrative that gets spun, and so the pictures then take on even more gravity and significance. My point is that it is very complicated. As to what the soldier is holding? That’s a great question. I didn’t comment on it because I couldn’t say for sure. My first thought, like yours, was that it was something like a camera, but it really doesn’t look like that to me in any way. It looks like a roll of black tape, but I have no idea why he would be holding that up … It is something of an ambiguity in the photograph, and hence something of a problem for figuring what to make out of the image. I found your post to be pretty insightful, having just stumbled upon your blog this morning. I would like to point out that while your questions about the how the soldier in the picture is reacting are certainly valid – you seem to have missed the biggest cues about that reaction in your analysis: Not only is the soldier not even holding his primary firearm, but the impression I get looking at his hands, is that he’s not holding any sort of weapon there. I don’t know what he is holding – but it is not a pistol, nor a knife. Those details mean as much to me as seeing his face or eyes would have meant – and do much to defuse some of the tension in the image.